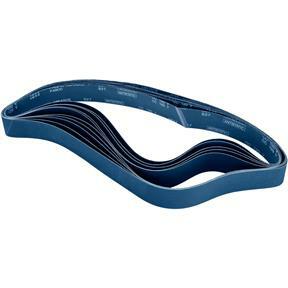 3" x 79" Z/A Sanding Belt 120 Grit, 10 pk. Grizzly T27572 - 3" x 79" Z/A Sanding Belt 120 Grit, 10 pk. These ultra-tough sanding belts are made of zirconia alumina resin, which is just what you need for weld removal and the finishing of ferrous and non-ferrous materials. The full resin bond system used in making these belts provides increased strength against your toughest jobs, and the durable Y-weight polyester, waterproof cloth backing means reduced wear and longer life. Set of 10 3" x 79" belts, 120 grit.